Published 14 October 2010. Efua Theodora Sutherland (1924-1996) renowned playwright from Ghana, affectionately called Auntie Efua, entered into the annals of African cinema history in 1967, in association with the production of Araba: The Village Story. The film was produced by the U.S. television network ABC to document her successful Atwia Experimental Community Theatre Project. The initiative has the reputation as an innovative model for the internationally known theatre for development (TfD). She is well respected and admired as dramatist and writer, continuing in her chosen field of drama having never produced another film. Her role as foremother in African cinema, documenting African culture and experiences, is indicative of the practices of many African women. Some women have entered filmmaking as a primary career, while others have used the moving image as a medium of expression in their work. And thus, Efua Sutherland was a devoted and passionate cultural producer whose vision and influence continue to reach far and wide. During the 21 May 2014 interview with scholar Joyce Osei Owusu I was able to get a closer look at the legacy of Efua Theodora Sutherland. Beti Ellerson: I have heard about Efua Sutherland as a pioneer in African cinema but beyond the description of her film production Araba: The Village Story (1966) that is often cited, there appears to be very little documentation. Would you know whether Araba is available for viewing and whether the specifics of her as it relates to her role is actually known? It would be of great value to finally get more particulars about her role as a pioneer in Ghanaian "cinema". When I participated in the African Women's Film Forum in Ghana in 2013, I was surprised at the dearth of information known about her role and her work among Ghanaians. Joyce Osei Owusu: Sutherland successfully established herself as a dramatist and a scholar in the arts. Her invaluable contribution to the Ghana national theatre movement is well documented, but information on her pioneering filmmaking engagement still remains obscure. The film seems to have disappeared and at this point the little we know are the facts that her docudrama Araba: the Village Story (1967) tells its story from the perspective of a young Tuesday born girl, Araba (played by Naana Nketia); it is set in the village of Atwia in the Central Region of Ghana, which was one of Sutherland's primary oral tradition research sites; and notably it has been internationally acclaimed to be a pioneering model for contemporary popular theatre for development. Apart from the fact that Sutherland collaborated with the U.S. network ABC to make the film, the specific role she played is yet to be uncovered. During my field work in 2013, I interviewed key family members and colleagues who worked closely with Sutherland, but I did not uncover much about the film. I have been in close contact with some of the people I interviewed and recently through a follow-up, I learned new information. I gathered that the ABC team that worked on the project included an exceptional woman, Merle Worth. At this point there are no leads to her whereabouts. I have discovered Merle Worth worked as an editor on the documentary film East Meets West(now re-titled Raga), which was directed by the American director Howard Worth. I have also learned that Howard in the 1960s worked on a lot of ABC projects in Sub-Sahara Africa. This was the period Araba was made. Hence, currently, I am making efforts to contact Howard to see what more we can learn. …It was also in the final phase of her work that she gave to Ghana and the African world probably her grandest artistic vision for uplifting and reuniting African peoples through the arts—an original proposal for the Pan African Historical Theatre Festival, the Panafest Movement. This final gift underscores the significance she attached to connections between Africa and the Diaspora. She played a very critical role in the establishment of the W.E.B. DuBois Memorial Centre for Pan African Culture. She belonged to an extensive global network of friends, many of them eminent creative minds. “In Memoriam: Efua Sutherland 1924-1996.” ALA Bulletin. African Literature Association. Summer 1996, pp. 8-19. Kofi Anyidoho, James Gibbs. FonTomFrom: Contemporary Ghanaian Literature, Theatre and Film. Rodopi, 2000. 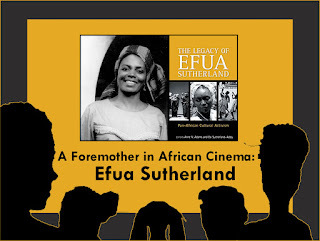 The Legacy of Efua Sutherland: Pan-African Cultural Activism. Anne V. Adams and Esi Sutherland-Addy. Ayebia Clarke Publishing Ltd; Africa Edition, 2007. “Auntie Efua We Cannot Forget” by Kofi Anyidoho. “Tributes”, published for the funeral of Efua Sutherland, 1996.